The Rockies send LHP Tyler Anderson (4-3, 4.62 ERA) to the mound to face the Dodgers’ LHP Rich Hill (1-2, 5.30 ERA). Anderson has been better on the road this season; he’s 3-0 with a 4.08 ERA in nine starts away from Coors Field. His last two road starts have been even better: he’s put up a 1.93 ERA over 14 innings. In his lone start against the Dodgers this year he didn’t do well, going five innings and giving up five runs on seven hits, although he avoided taking the loss. Hill’s second start off the DL wasn’t as good as his first: he gave up four runs on five hits to the Mets and hit three batters while doing so. 1923	Dodger first baseman Jacques Fournier goes 6-for 6, collecting a home run, two doubles, and three singles. The southpaw-swinging slugger’s 11 total bases contribute to Brooklyn’s 14-5 victory over the Phillies at the Baker Bowl. 1960 The Phillies strike out a dozen times in each end of a doubleheader when they are swept by the Dodgers at Connie Mack Stadium, 6-3 and 5-2. The 24 K’s tie a major league record for strikeouts in a twin bill. 1990 For the first time since 1917 (Hippo Vaughan and Fred Toney), two no-hitters are thrown on the same day when the A’s Dave Stewart shuts out the Jays 5-0 and the Dodgers’ Fernando Valenzuela blanks the Cardinals, 6-0. 2012 In the Diamondbacks’ 9-3 victory over Milwaukee at Miller Park, Aaron Hill becomes the first modern-era player to hit for the cycle twice in one season since Babe Herman accomplished the feat with the Brooklyn Robins in 1931. Eleven days ago in Seattle, the Arizona second baseman also collected a single, double, triple, and home run in the game. 2015 Joc Pederson becomes the third rookie in major league history to hit 20 home runs before July when he goes deep off Allen Webster in the Dodgers’ 10-6 loss to Arizona at Chase Field. The 23 year-old center fielder joins Wally Berger (Braves, 1930) and Albert Pujols (Cardinals, 2001) in accomplishing the feat as a freshman. The Dodgers trot out LHP Clayton Kershaw (11-2, 2.47 ERA) to face the Angels’ RHP JC Ramirez (7-5, 4.38 ERA). Kershaw’s given up a career high 17 HRs but has otherwise been his usual superb self this season. Against the Angels he has a career 5-2 record, 2.69 ERA and 0.99 WHIP. Ramirez is a converted reliever; this is his 13th career start. In his last one he went six innings and gave up only one run against the Red Sox. 1960 The Phillies strike out a dozen times in each end of a doubleheader when they are swept by the Dodgers at Connie Mack Stadium, 6-3 and 5-2. The 24 K’s tie a major league record for strikeouts in a twin bill. Surprise! Drysdale started the first game and Koufax started the nightcap. Neither of them finished their games. 2015 Joc Pederson becomes the third rookie in major league history to hit 20 home runs before July when he goes deep off Allen Webster in the Dodgers’ 10-6 loss to Arizona at Chase Field. The 23 year-old center fielder joins Wally Berger (Braves, 1930) and Albert Pujols (Cardinals, 2001) in accomplishing the feat as a freshman. He has since been joined in that company by current Dodger Cody Bellinger. The Angels come to Dodger Stadium a game over .500 and playing without superstar Mike Trout, who’s out for at least two more weeks with a torn ulnar ligament in his thumb. They will also have Albert Pujols, he of the 600+ HRs, playing 1B in one of the two games in the NL park, something he’s done only four times this season. The Angels send old friend RHP Ricky Nolasco (2-9, 5.23 ERA) out to face the Dodgers’ LHP Rich Hill (4-3, 4.73 ERA). Nolasco got slammed for five runs in 5 1/3 innings against the Yankees in his last start and took the loss. He leads the AL in HRs allowed with 23. Hill got the win his last time out against the Mets, giving up only one run in five innings. He still hasn’t gotten into the sixth inning yet this year. Cody Bellinger, your NL Player of the Week. Jay Jaffe of Sports Illustrated praises the Dodgers for their exploits thus far. 1944 At the Polo Grounds with over 50,000 fans looking on, the New York major league teams face each other in a six inning three-team game (a team played consecutive innings against the other two teams then sat out an inning) to raise money for war bonds. 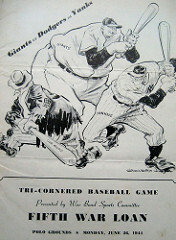 The charity contest, billed as the Tri-Cornered Baseball Game, ends with the final score of Dodgers 5, Yankees 1, Giants 0. 1968 Cardinals right-hander Bob Gibson tosses his fifth consecutive shutout as he blanks the Pirates, 3-0, in the first game of a doubleheader played at Busch Stadium. The future Hall of Famer’s accomplishment is one shy of the major league mark, set earlier in the month by Don Drysdale of the Dodgers. 1999 At Candlestick Park‚ Todd Hundley’s second homer of the day‚ a ninth inning three-run shot to deep right field off Giants’ closer Robb Nen, sparks the Dodgers’ 7-6 comeback win. Ellis Burks had put San Francisco ahead in the bottom of the eighth, 6-4, with a three-run homer off Alan Mills. Bud Norris (6-9, 4.27 ERA) goes for the Dodgers and Patrick Corbin (4-9, 5.31 ERA) pitches for the D-Backs. It’s a rematch for these two pitchers: between the two of them they gave up 10 earned runs and 15 hits in nine combined innings in a 13-7 Dodgers win on July 15. Roberts said Yasiel Puig will start on Sunday for the first time in a week. There have been several different rumors about a possible trade including Puig, so I’m wondering if this is a showcase game for him. CBS Sports came up with eight different teams to which he might be traded. He’s also been rumored to be part of a three-team deal with the Reds for Jay Bruce. Dodgers first baseman Adrian Gonzalez is one home run away from joining the 300-homer club. He would become the seventh active player to reach 300 homers and 400 doubles. The other six are Miguel Cabrera, Albert Pujols, David Ortiz, Alex Rodriguez, Adrian Beltre, and Carlos Beltran. Pretty good company, I’d say. I think five of the six are locks for the Hall of Fame, and A-Rod would be were it not for his PED use. Kershaw versus Heaney. The prime-time pitcher versus the rookie. Heaney, briefly a Dodger last winter, is 6-2 with a 3.18 ERA. Kershaw is 12-6 with a 2.18 ERA. Kershaw will want to be wary of Pujols, who is hitting .440 off the Dodgers’ ace and has a .563 on-base percentage, the third-highest mark by anyone with at least 10 at-bats against him. Load up with right-handed hitters!